For many of us, that moment on December 18, when we sit down in that movie theater and the lights go down for Star Wars: The Force Awakens, is going to be something we’ve been waiting a long, long time for. It’s hard not to get a little bit giddy about the prospect of seeing new Star Wars on the big screen, and now, thanks to a new report making the rounds, we’ve got an idea of what we’re going to see right off the bat. As usual, there are potential SPOILERS beyond this point. Also, this is an unconfirmed rumor from an unnamed source, so take it with a grain of salt and make of it what you will. PSA over. Making Star Wars is back with another in a long line of scoops. We won’t know if any of them are actually accurate for a while, but they seem to put a lot of stock in their sources. This time, they’ve got a description of the opening scene from The Force Awakens, much of which jives with things we’ve heard before. According to their report, the film does indeed open with a lightsaber (no hand mentioned this time) in space, falling to the ground, landing in what they call a “savannah environment,” whatever that means. A farmer named Naka discovers the weapon, accidentally extends the blade, and inadvertently starts a fire. He then takes the Jedi weapon to a character called The Vicar. The report thinks this is Max von Sydow, who is certainly distinguished enough to play a character named The Vicar. 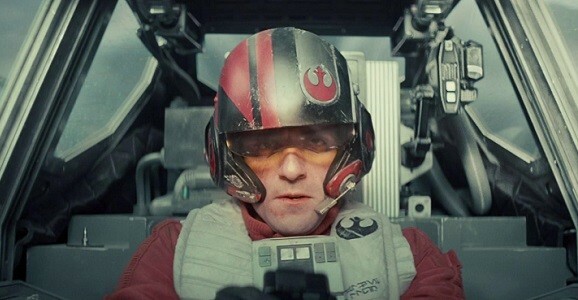 After obtaining the lightsaber, he contacts the Rebels, or at least the modern incarnation, and Oscar Isaac’s Poe Dameron shows up on the scene. Here’s the problem, when Poe arrives, so does the Empire. It’s unclear whether The Vicar called them, too, if they followed Poe, intercepted a message, or what. Regardless, they’re there, which is a problem. He places the lightsaber inside his trusty droid BB-8, reminiscent of Luke and R2-D2, and while the droid runs, he gets ready to throw down with a bunch of stormtroopers. While this is going on, we reportedly check in with John Boyega’s Finn, who is indeed a stormtrooper. It sounds like this happens at the same time, perhaps we cut back and forth between Finn and Poe in this situation, but it’s not 100% clear. Finn doesn’t seem cut out to be a stormtrooper, and sees his best friend die in battle and allows some innocent villagers to escape. Kylo Ren has him arrested, and Finn finds himself in the brig on a Star Destroyer with none other than Poe Dameron, also a prisoner. We’ve heard reports of this before, and the two reluctant allies come up with a plan to steal a TIE Fighter and escape. To us this sounds like they’re going to be BFFs before too long, and perhaps this is the start of a Luke/Han style friendship for the ages. So there you have it. This certainly sounds like an exciting way to kick off a movie, though I’m still curious about the floating lightsaber part of the equation. We’ll just have to wait and see. At a recent event, director J.J. Abrams acknowledged that some of rumors going around are in fact legit, while others are not so accurate. It’s going to be interesting to see which of the many, many spoilers turn out to be true and which are total BS. I can’t wait for this movie. The new SW fans are going to freak out over this. The closer we get, the more pumped I am. Oh, Stop. I worship at the alter of JJ. I grew up watching ST:TOS in the early 70s in syndication and then Star Wars came out and my mind exploded. Love both the universes. Each totally different but just as fascinating. Okay, seriously! The correct word is “jibe”, not “jive”! You use that same word incorrectly in nearly every article about Star Wars. Please get it right! You don’t really realize how ridiculous you’re coming off do you? I’ve been following Making Star Wars for awhile now and I have reason to believe a lot of the information they are putting out is misinformation from the production. I didn’t think they were necessarily aware of that but any comment that anyone makes about these rumors possibly being red herrings is now being deleted. Why? If you’re just publishing scoops from anonymous sources why delete comments suggesting that those sources are giving misinformation. I don’t trust a word from Making Star Wars at this point.